John Y. Cole is a librarian and historian who has served the Library of Congress in many roles since 1966. Currently he is the founding director of the Center for the Book. Under his leadership, the Center for the Book has grown into an office of national and international importance with affiliates in all fifty states and abroad. He is the recipient of the American Library Association’s Lippincott Award. Dr. Cole is recognized as the leading historian of the Library of Congress, having published extensively about the history of books and libraries in society and the history of the Library of Congress. Dr. Cole has been instrumental in shaping many significant programs of national significance, including the National Book Festival (2001), the National Ambassador for Young People’s Literature (2008), the Library of Congress Young Readers Center (2009), and the Library of Congress Literacy Awards, initiated and funded in 2013 by philanthropist David Rubenstein. For more information about Susan Cooper, including an interview, visit her website thelostland.com. Also check out her Facebook page. Grace Worcester Greene has spent her career working in libraries with and for young people. Greene recently retired from her position as the Youth Services Consultant at the Vermont Department of Libraries, where she worked for nearly three decades. Previously Greene was the Head of Children’s Services at the Robbins Library in Arlington, Massachusetts. In addition to her library positions, Greene has served as adjunct faculty at several New England colleges teaching courses in children’s literature and collection development. Her professional activities have included memberships and leadership positions in multiple literacy and library nonprofits and organizations, including the Children’s Literacy Foundation, Vermont Center for the Book, and the American Library Association. Greene has also chaired the prestigious Boston Globe-Horn Book Award committee and served as a member of both the Newbery and the Caldecott Medal Award committees. She holds an M.S. degree in Library Science. Greene currently resides in Vermont. 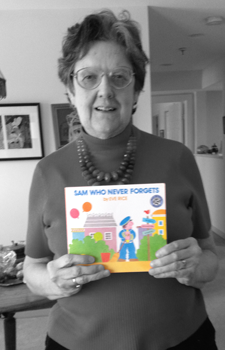 Grace recommends the picture book Sam Who Never Forgets, written and illustrated by Eve Rice (Greenwillow Books, 1977). Lynda Johnson Robb is the oldest daughter of former President Lyndon B. Johnson and Lady Bird Johnson and a self-proclaimed “professional volunteer.” She is currently President of the National Home Library Foundation; Chair Emerita of Reading Is Fundamental; and a member of the board of the Lady Bird Johnson Wildflower Research Center. She lives in Virginia with her husband former Virginia Governor and former United States Senator Charles Robb. 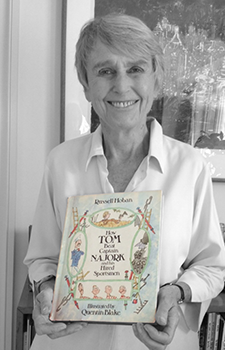 Susan Roman, a renowned expert in children’s literature and literacy, is Dean Emerita and Professor at Dominican University’s Graduate School of Library and Information Science located in River Forest, Illinois. She came to Dominican University from the American Library Association where she served as ALA’s first director of development. Roman began her career at ALA in 1986 as executive director of the Association for Library Service to Children (ALSC). At that time, she was also named the executive director of the Association for Library Trustees and Advocates (ALTA). Roman has also served as a member of the national advisory committee for the International Children’s Digital Library, First Book, PBS Ready to Learn, and for the PBS children’s television series Reading Rainbow. Maria Salvadore now works as a children’s literature specialist, consulting with local and national organizations. Before becoming a consultant, Salvadore served as Coordinator of Children’s Services for the District of Columbia Public Library system. Prior to her return to Washington, she worked as the Children’s Services Coordinator in Cambridge (MA) Public Library. While in Massachusetts, she taught at Simmons College of Library Science and worked with the Center for the Study of Children’s Literature. She continues to teach level courses in the iSchool at the University of Maryland College Park. Salvadore continues to review children’s and young adult books for various professional journals. She was consulting editor and contributor to The Essential Guide to Children’s Books and Their Creators and contributed to Children’s Books and Their Creators (both edited by Anita Silvey) and co-authored Books Your Children Will Talk About with Susan Hepler (NEA, 2003). 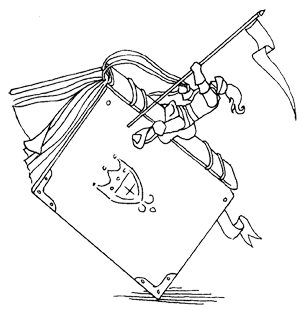 Salvadore has served on or chaired various award juries including the Boston Globe/Horn Book Awards, the Caldecott Medal, Newbery Medal, the Washington Post/Children’s Book Guild Nonfiction Award, and the Notable Children’s Book Committee. She holds Masters degrees in Education and Library Science. Read an interview with Maria Salvadore. Hilary Breed Van Dusen is a Senior Editor at Candlewick Press Publishing where she concentrates on middle-grade and young adult nonfiction, as well as fiction for the same age groups. Previously she worked as the assistant director of the NCBLA, and as the editor-in-chief of the NCBLA website. Her publishing career includes work in both the trade and educational book arena. For seven years she worked as an editor of children’s books at Little, Brown and Company. As an acquiring editor at Heinemann, she managed two lists of professional development books in the area of elementary math and science. She also worked as a curriculum editor of teacher’s guides for elementary science materials published by Steck-Vaughn. She has written and edited reviews for The Horn Book Guide, taught the Junior Great Books program in her local elementary school, and volunteered in her local public school library. Rachael Walker consults on a wide variety of educational programs and multimedia projects with a special focus on children’s literacy. She has conceptualized innovative programs, launched national campaigns, coordinated special events, and developed original content for film, television, web, and print projects. She played a key role in establishing the National Education Association’s Read Across America as the nation’s largest celebration of reading, designing and developing Lights On! Afterschool for the Afterschool Alliance, and creating and managing National D.E.A.R. (Drop Everything and Read) Day for HarperCollins Children’s Books. She is currently a literacy advisor for the PBS Ready to Learn Project and is working to create resources and develop key partnerships to benefit children, families, and educators for Little Free Library, The Reading Connection, and WETA’s Learning Media initiatives: Reading Rockets, Colorin Colorado, and AdLit.org. Learn more about Rachael and her work at BelleoftheBook.com. 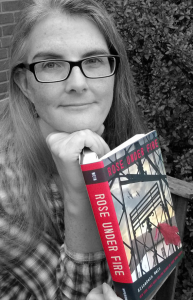 Rachael recommends Elizabeth Wein’s Rose Under Fire (Hyperion, 2013). Based on the memories of real people who suffered and witnessed the horrors at the Ravensbrück concentration camp, this brilliant historical fiction for teens is a difficult story that needs to be told—and never be forgotten.